This prototype eight was designed by Luigi Colani for Karl Adam, coach of the Federal Republic of Germany's Olympic eight, in 1972. 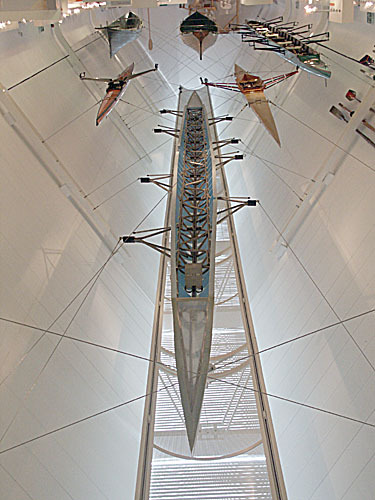 A one-piece titanium frame incorporating outriggers is covered by an opaque composite skin (expoxy, glass and carbon fibre), resulting in a very strong boat weighing only 65-70 kilograms, about 40 kilos less than the lightest eights then available. Unconventional in every way, the boat proved very fast in a test, but was disabled by a fault in the seats which run on ballbearings on three tracks. It was never used, earning the nickname Glass Casket.